Attention disorders are prevalent in 5% of the total population and are commonly diagnosed on the basis of a patient’s clinical history and an examination aided by symptom check sheets. A new study published in BMC Medicine finds that EEGs (electroencephalograms) can reliably detect specific brain differences associated with attentional disorders that are not observed in control subjects. Here to tell us more is lead author of the study, Frank Duffy. The ability to sustain focused attention has been considered a human attribute that may be as crucial to our species’ dominance as the development of spoken language. Good attention skills are critical for modern educational success and a successful, prosperous life. Disorders of attention, which have a 5% prevalence rate in the overall population, need little introduction. And their prevalence may actually be much higher if they are also identified as a component of more established psychiatric/neurologic disorders. For example, over 30% of those diagnosed as being on the autistic spectrum will also manifest a disorder of attention. Attentional issues may arise as part of many other psychiatric diagnoses (e.g., bipolar disorder), from neurological complications (e.g., head injury), or may be of undetermined, possibly genetic, origin. Attentional disorders are commonly diagnosed by psychologists, psychiatrists and neurologists on the basis of a patient’s clinical history and an examination aided by standardized symptom check sheets. MRI studies of attentional disorder have led to a plethora of findings, such as localized changes in brain grey and white matter volume, but these, in aggregate, have not yet proven to constitute a clinically successful diagnostic measurement of attentional disorders in formal trials. We analyzed 20-minute samples of awake, resting EEGs (electroencephalograms) in a population of 377 patients with attention deficit disorder (ADD) and 619 controls, using an analytic technique known as EEG coherence. 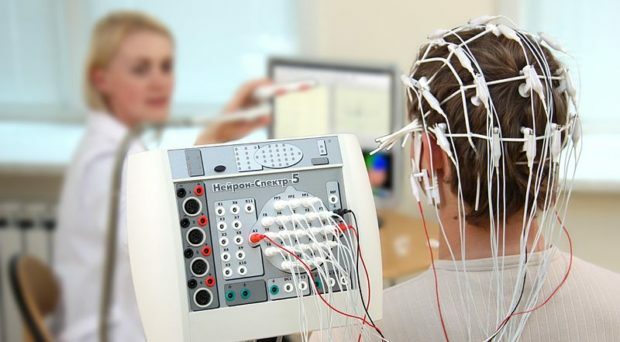 EEG coherence is a measurement that assesses connectivity between EEG electrodes to determine how different regions of the brain interact. EEG coherence is a measurement that assesses connectivity between EEG electrodes to determine how different regions of the brain interact. We found that EEGs contain adequate information to reliably detect specific brain differences associated with attentional disorders that are not observed in control subjects. More specifically, we discovered an aberrant pattern of electrical connectivity between brain regions that distinguishes patients with an attentional disorder from controls. This diagnostic pattern of coherence difference, or “connectome”, identifies attentional disorders whether or not subjects are on or off medications and whether the attentional symptoms manifest in clinical isolation or as part of other known disorders. By contrast, attentional disorders cannot be specifically identified from EEGs by the kind of traditional expert visual inspection that is commonly used to identify epilepsy. EEGs are relatively inexpensive compared to MRIs. The complex ‘diagnostic connectome’ we have discovered could be readily exported to relatively inexpensive computers for remote use. However, traditional diagnosis of attentional disorders by experts is generally accurate and sufficient for the majority of routine clinical purposes. Our ‘EEG attentional connectome’ might be of both clinical and research value because the discriminant analysis that is needed to generate it provides a single measure (the discriminant function) which reflects an individual’s degree of attentional disorder. This function in effect provides a ‘distance measure’ between an individual subject’s data and the neuro-typical population group. The complex ‘diagnostic connectome’ we have discovered could be readily exported to relatively inexpensive computers for remote use. We propose that the impact of any intervention (e.g. medication, behavioral therapy, EEG neuro-feedback) might be better judged by before-and-after comparisons of the discriminant function score showing the relative position of a patient along the control-attentional disorder axis. An objectively derived score of this kind might prove to be more sensitive to subtle improvements of brain function related to a specific intervention than subjective reliance on change in clinical history and clinical check sheet scores. As of yet, this remains a speculation to be proven, although likely valid. In general, EEG coherence connectomes delineate aberrant brain physiology, not specific clinically derived diagnoses. As such, the EEG coherence pattern that we have identified does not diagnose a specific attention disorder, such as ADD. Instead, it detects the brain pattern associated with attentional disorders across many psychiatric conditions aside from, and of course including, pure ADD. To become a worthwhile diagnostic test, EEG coherence analyses must be quantitatively explored in other neuro-psychiatric conditions to avoid confusion between symptom and disease and to ensure, for example, that attentional issues which manifest as symptoms of autism spectrum disorder do not get misdiagnosed as pure ADD. To date, successful EEG coherence studies, comparable to the current Attentional Disorder study, have been published in Chronic Fatigue Syndrome, Autism Spectrum Disorder, Asperger’s syndrome, and Schizophrenia Prodrome Syndrome with more studies soon to follow. Dr Frank Duffy is a physician, child neurologist, clinical electroencephalographer and neurophysiologist at the Department of Neurology, Boston Children’s Hospital and Harvard Medical School. His current research interests are in neuro-developmental disorders and epilepsy including the development and utilization of specialized analytic techniques to support related investigations. Dr Duffy’s undergraduate degrees are in electrical engineering and mathematics.